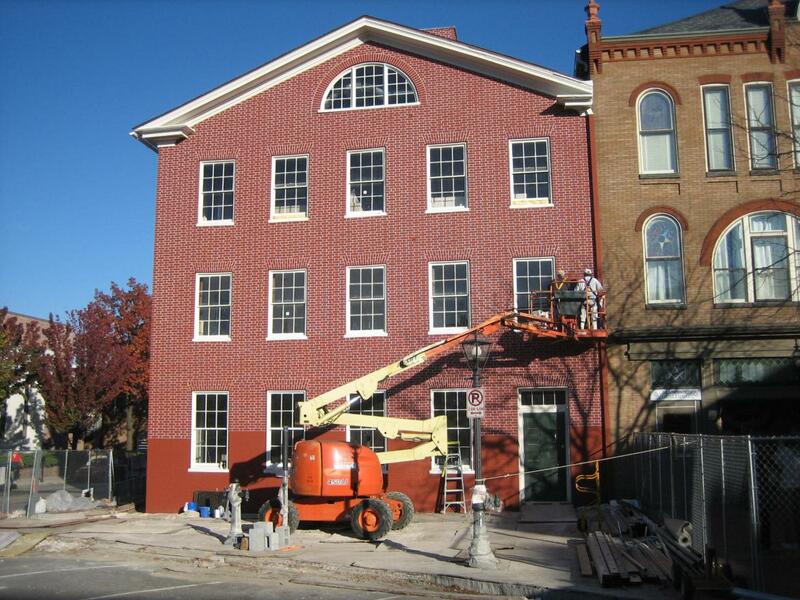 The white stenciling around the red bricks on the west side of Gettysburg’s David Wills House is progressing very well, and might be finished by next week. This view was taken from the west facing east at approximately 4:45 PM on Friday, October 31, 2008. The David Wills House, where President Abraham Lincoln stayed the night before giving his Gettysburg Address, has white stenciling (or “penciling” as Gettysburg Maintenance Chief Marc Pratt explained at our fall Licensed Battlefield Guide Meeting Wednesday night) completed around the red bricks on its north and east sides, and now much of the west side. There are also marble steps, a black railing, and green shutters on the north side of the building. See our post on the progress on the stenciling on the west side on October 28, 2008. See our post on the completion of the white stenciling on the north side on October 21, 2008. See our post on white stenciling appearing on the north side on October 14, 2008. 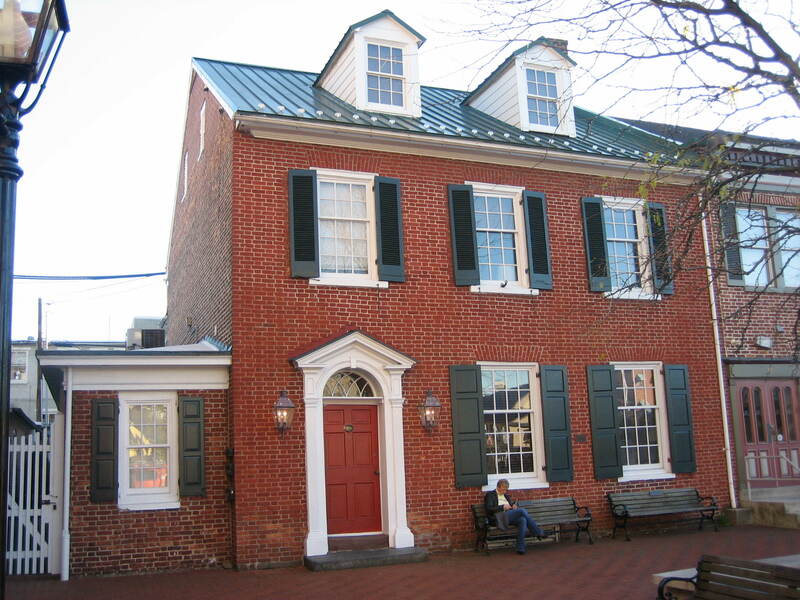 See our post on the Wills House needing a new manager on September 12, 2008. See our post on the first coat of red paint completely covering the north side on September 4, 2008. 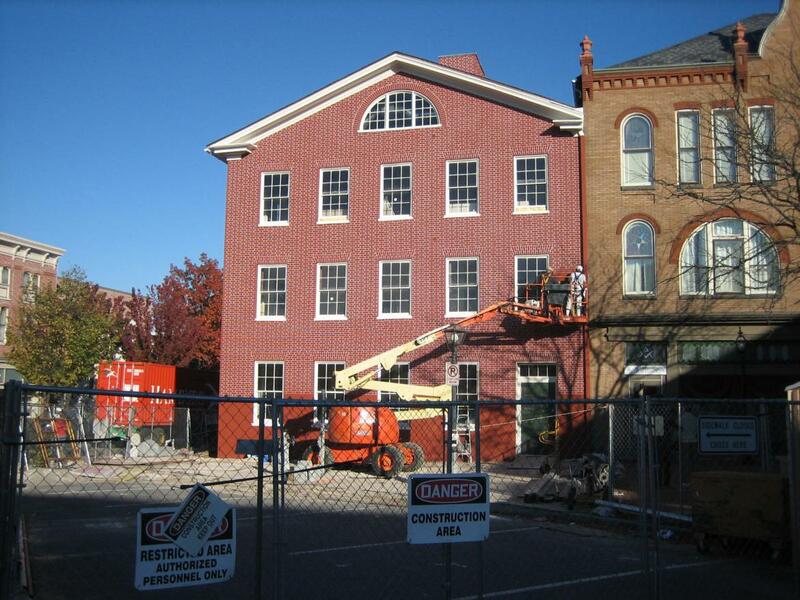 See our post on red paint beginning to cover the north side on September 3, 2008. See our post on only the west side still had red paint on August 19, 2008. 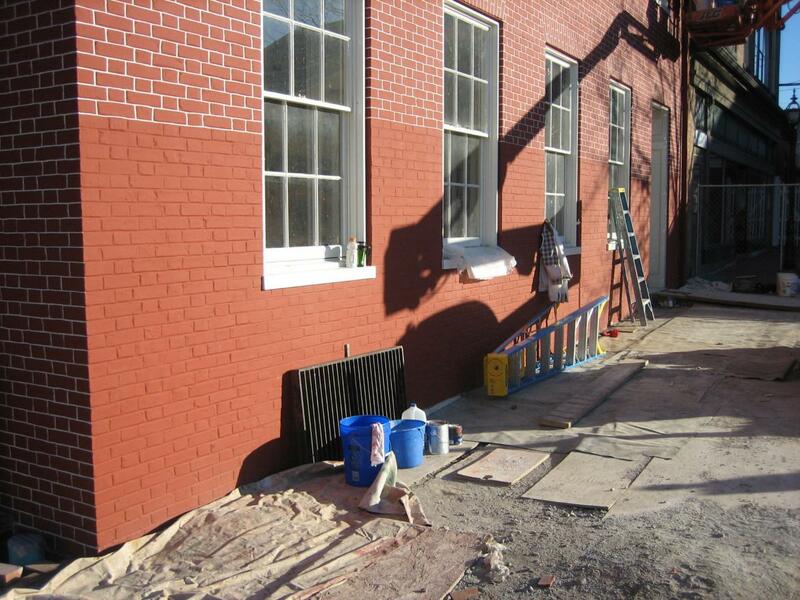 See our post on the west side started to be painted red on August 13, 2008. 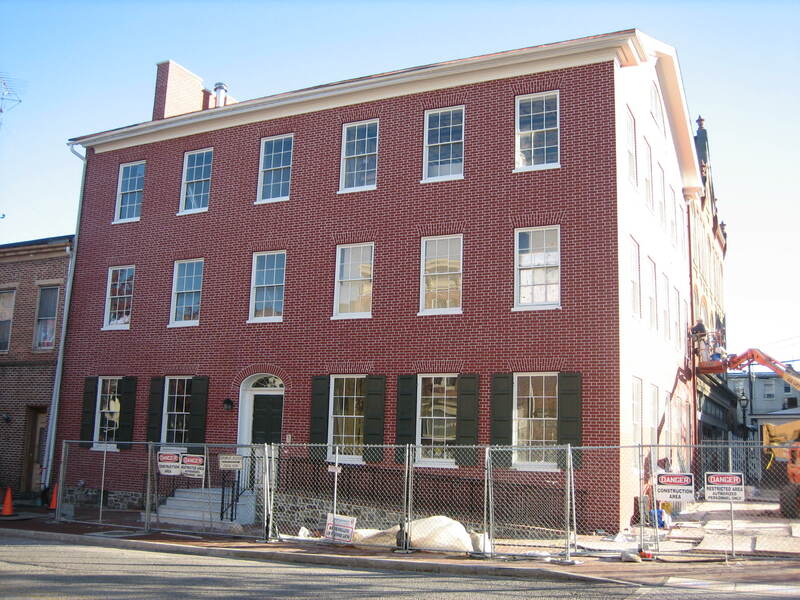 See our previous post on the Wills House’s sidewalk construction on July 21, 2008. See our post on the Diamond at Gettysburg early in the morning on March 2, 2008. A three man stenciling crew was down to two people today. They were finishing the second floor area. 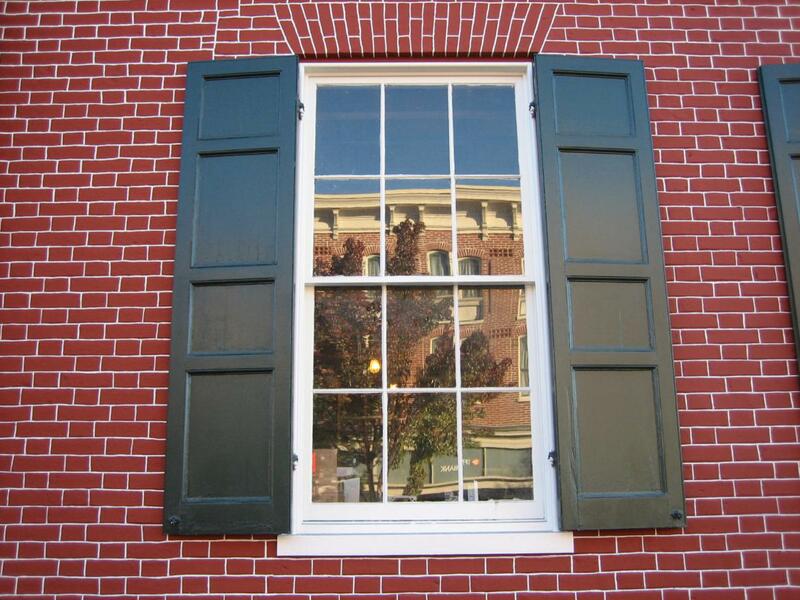 President Lincoln is showing “Perry Como” the window of his bedroom on November 18, 1863. It is on the second floor, the second window from the right. This view was taken from the southwest facing northeast at approximately 4:45 PM on Friday, October 31, 2008. There’s also been more progress on the north side of the house. There are white marble steps and a landing for the front door. 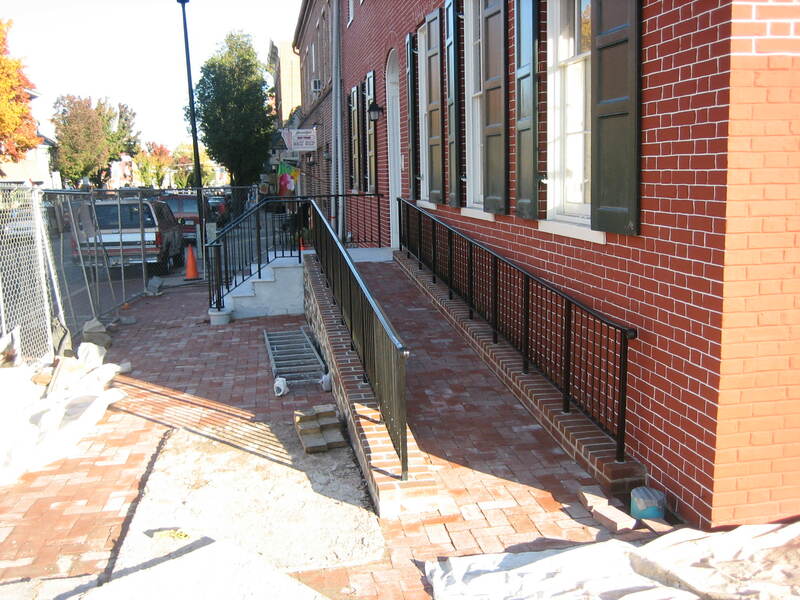 A black iron railing has been placed on the steps and the handicapped ramp. The first floor now shows green shutters. This view was taken from the north facing south at approximately 4:45 PM on Friday, October 31, 2008. 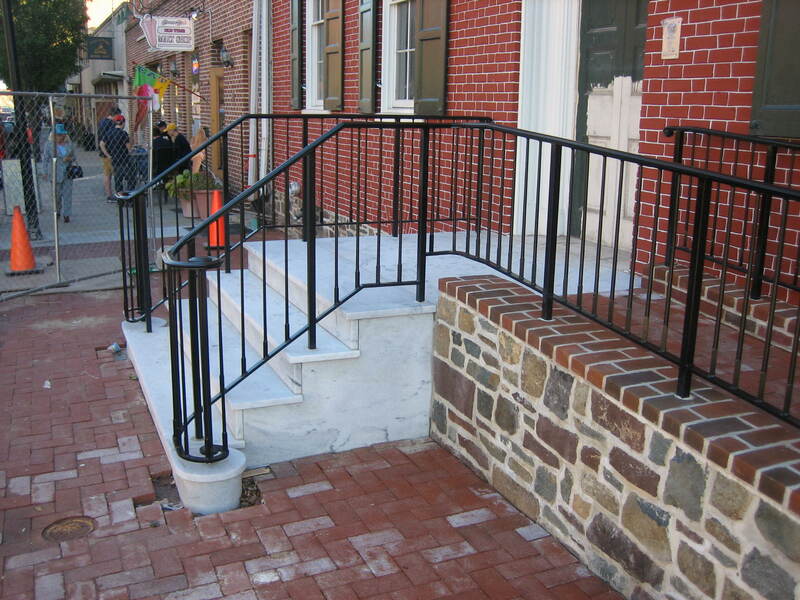 Here’s the black railing on the handicapped ramp. This view was taken from the northwest facing southeast at approximately 4:45 PM on Friday, October 31, 2008. 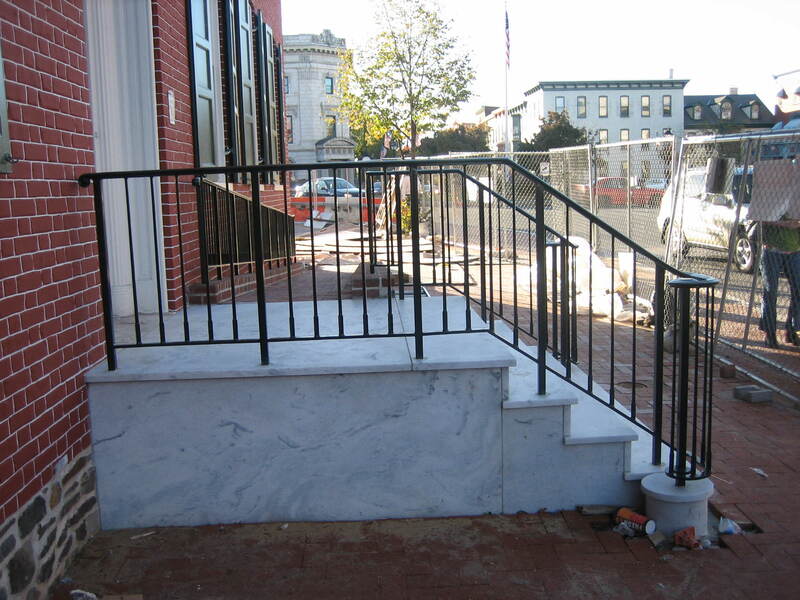 The black railing also covers the white marble steps and landing off the front (north) door. Lincoln appeared at the door the night of November 18, 1863 after the loud crowds in the square requested him to make a speech. Lincoln replied, “I appear before you fellow citizens, merely to thank you for this compliment. The inference is a very fair one that you would hear me, for a little while at least, were I to comment to make a speech. I do not appear before you for the purpose of doing so, and for several substantial reasons. The most substantial of these is that I have no speech to make.” The crowd laughed. This view was taken from the northwest facing southeast at approximately 4:45 PM on Friday, October 31, 2008. Lincoln then continued his November 18th remarks. “In my position it is somewhat important that I should not say foolish things.” [Interruption: “If you can help it!”] “It very often happens that the only way to help it is to say nothing at all.” Again the crowd laughed. “Believing that is my present condition this evening, I must beg of you to excuse me from addressing you further.” President Lincoln then went back inside the Wills House. This view was taken from the east facing west at approximately 4:45 PM on Friday, October 31, 2008. 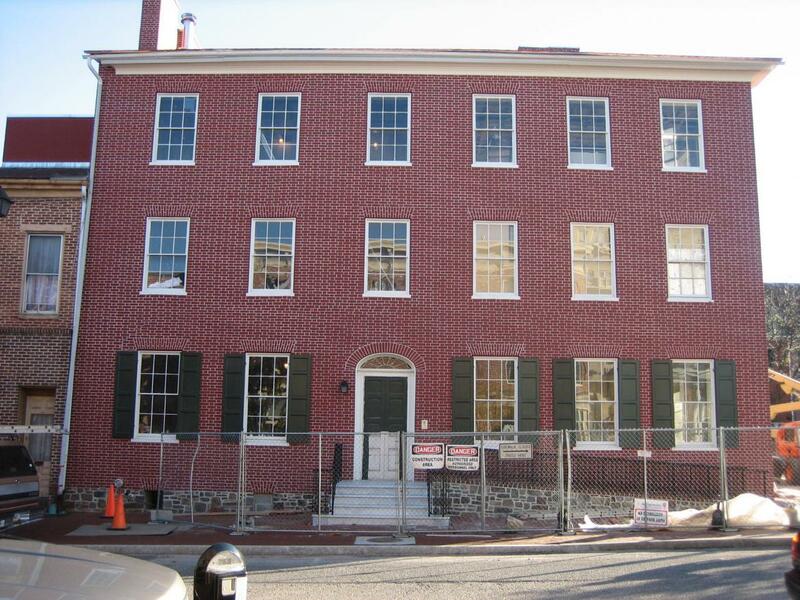 Another recent addition are the green shutters on the first floor. This view was taken from the northeast facing southwest at approximately 4:45 PM on Friday, October 31, 2008. 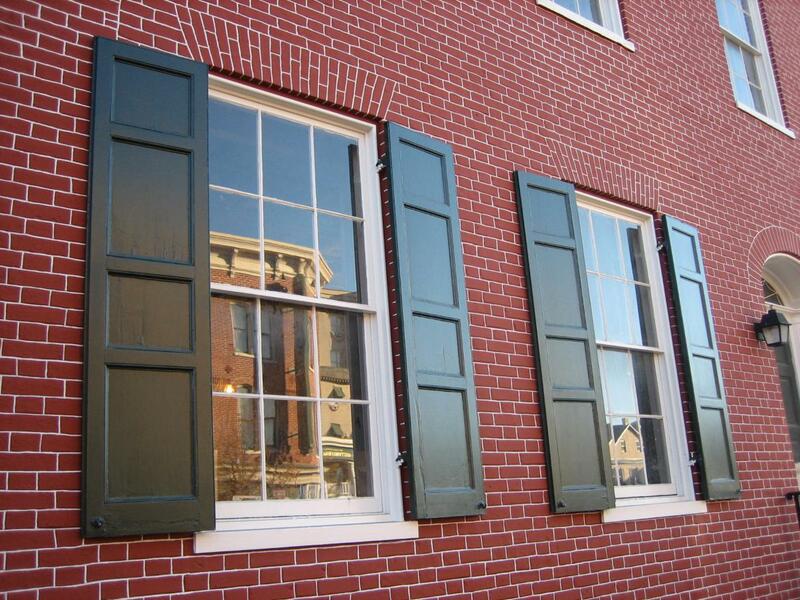 The shutters are wooden… This view was taken from the northwest facing southeast at approximately 4:45 PM on Friday, October 31, 2008. … and closely resemble those on the first floor of the Joel B. Danner House on the southeast quadrant of the Diamond/Circle/Lincoln Square. This view was taken from the northeast facing southwest at approximately 4:45 PM on Friday, October 31, 2008. When they start on this lower section of stenciling/penciling, don’t get your hopes up that they won’t need the lift anymore and that the sidewalk will be open. This view was taken from the northwest facing southeast at approximately 4:45 PM on Friday, October 31, 2008. They will still need the lift to place the shutters on the second and third floor windows. This view was taken from the west facing east at approximately 4:45 PM on Friday, October 31, 2008. 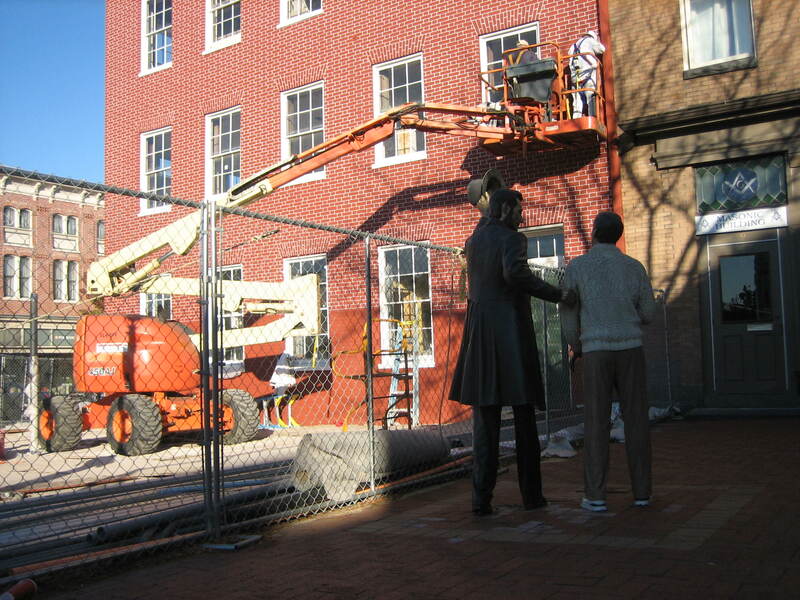 Just 104 days until opening day, February 12, 2009, the bicentennial of Lincoln’s birth. This view was taken from the northwest facing southeast at approximately 4:45 PM on Friday, October 31, 2008.